Browse through our cool selection of balloon gifts. From colorful balloon pictures to how-to instructions for creating a hot air balloon model to the mysterious "balloon in a box" gift, there's bound to be something you like. Each of those gifts is an imaginative and inexpensive way to say 'Happy Birthday', 'I love you' or simply 'Have Fun'. Balloons put a smile on people's face - no matter how old they are. Only the best ideas we've come across will make it into our handpicked selection. Some of them you can easily make yourself, and we'll show you how. For the others we've researched online shops to find out where you get best value for money. Our first example is the 'Balloon in a Box'. It takes some time to make it, but the result is certainly worth the effort. 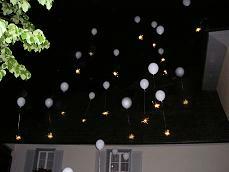 A Romantic Balloon Release at Night makes a wonderful surprise gift for a birthday or a wedding. 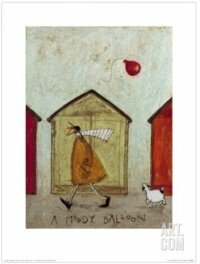 Click here to see our colorful selection of balloon pictures, posters and prints. Clicking on the image will take you to Art.com, where you can purchase balloon pictures as fine art prints. 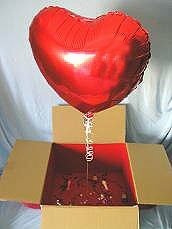 A Hot Air Balloon Model can be a spectacular "wrapping" for a balloon ride gift voucher, but it also makes an impressive gift on its own, especially if it is self made. 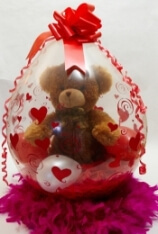 Stuffed Balloons make a delightful gift in a balloon and create special accents for your decoration. Learn about the different types, how to make them and when using a balloon stuffing machine makes sense. Click here to learn all about stuffed balloons. Surprise your loved ones with a Balloon Delivery, the ideal birthday balloon gift. 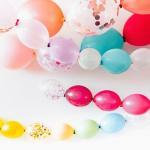 Our simple tips will turn your balloon greetings into a big success every time. 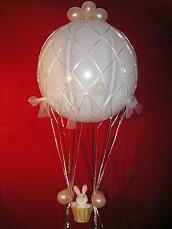 Click here to get best value for money from your balloon delivery service. For those in a hurry: Our featured delivery services offer same day delivery.